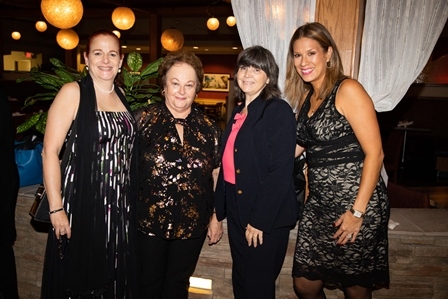 SUFFERN, N.Y. (December 3, 2018) – Good Samaritan Hospital, a member of the Westchester Medical Center Health Network (WMCHealth), recently held its annual Girls’ Night Out event to raise funds for its nationally recognized Center for Breast Health. The evening was a celebration of camaraderie, strength and taking charge of one’s health. It included a high-end shopping experience, mini makeovers, a silent auction, raffles, dinner and more. Karen Karsif, MD, Medical Director of The Center for Breast Health at Good Samaritan Hospital discussed the latest advancements in breast cancer diagnosis and comedian Erin Jackson provided the night’s entertainment. The event raised approximately $47,000 to benefit Good Samaritan Hospital’s Center for Breast Health. Proceeds will help the hospital further invest in state-of-the-art facilities, leading-edge technology and innovative services. “Breast health is every woman’s concern. The more we all know about breast disease, the better prepared we are to achieve optimal health. Events like these remind us all that we are not alone in this fight, and if we come together we are powerful,” said Dr. Karsif. Girls’ Night Out is celebrated at hospitals across WMCHealth. Westchester Medical Center will host its Girls’ Night Out to benefit women’s heart health on February 8, 2019 and MidHudson Reginal Hospital’s Girls’ Night Out is scheduled for March 7, 2019. St. Anthony Community Hospital’s event will take place on May 16, 2019 and HealthAlliance Hospital will also host a Girls’ Night Out in 2019. The date for Good Samaritan Hospital’s 2019 Girls’ Night Out has already been selected, it will be held on Thursday, October 17, 2019. These annual events have become “must-attend” soirees for hospital staff and women throughout the Hudson Valley. For more information about The Center for Breast Health, please call (845) 357-7462 or visit GoodSamHosp.org/breastcenter. To make a donation to the Good Samaritan Center for Breast Health or see how you can help support local healthcare contact the Good Samaritan Foundation at (845) 368-5151 or visit us at www.BSCHSF.org/GoodSam/. From left, Karen Karsif, MD, FACS, Director of The Center for Breast Health; Nancy McKee, grateful patient; Mary P. Leahy, MD, CEO of Bon Secours Charity Health System; and Ana Paisley, Patient Navigator.